Walter Whitman, Jr. was born in New York on May 31, 1819, the second of nine children. The family was poor, and Whitman described his childhood as unhappy because of their economic problems. His formal schooling was over at age 11, and Whitman was largely self-educated. He was drawn to literature and studied the classics on his own. At the age of 12, he was introduced to the printing trade and began to write. Over the years, he held a variety of jobs as a printer, journalist, editor and teacher. For a time, he was editor of the New Orleans Crescent, and while living in New Orleans, he saw the tragedy of slave markets. This led him to write I Sing the Body Electric. In 1855, Whitman published the first edition of Leaves of Grass that he would spend the rest of his life editing and revising. Leaves of Grass was a very controversial publication. Although Ralph Waldo Emerson and others praised the book of free verse, many thought it was obscene and too sensual. When the Civil War started in 1861, Whitman became a freelance writer and visited soldiers in New York hospitals. When his brother was wounded in 1862, Walt went to Fredericksburg, Virginia, to care for him and was so affected by what he saw on the battlefield that he volunteered to care for the soldiers. He traveled with the wounded that were being transferred to Washington, planning to stay just a few days but stayed for 11 years. At that time, there was no formal training for nurses. Those who called themselves nurses learned by doing and, for the most part, gave medicines, fed patients and kept the hospitals clean. During the Civil War, male nurses outnumbered female nurses and, many times, were recovering soldiers. However, the huge number of wounded and sick soon made it necessary to allow women to be nurses as well. Hospitals were set up all over Washington with only a few being in buildings that were built specifically to be medical facilities. Because of poor sanitation and diet, a larger percentage of soldiers died from chronic diarrhea and typhoid fever than from battle wounds. 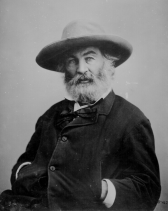 Whitman was unable to find a well-paying job in Washington because of his reputation as the author of Leaves of Grass and was forced to take a low-paying clerk's job. He spent almost all of his free time at the military hospitals caring for the wounded and ill soldiers. He tried to provide anything that the soldiers needed, bringing them food, writing letters and attending to their physical needs. Often spending his own money for supplies, he did all he could to bring them comfort. He was with many soldiers as they drew their dying breaths. Armory Square Hospital was one of Whitman's favorite hospitals, and he praised the work of the doctors and nurses there. Many of them praised his work as well. However, in spite of the care that Whitman provided for the soldiers as a volunteer nurse, some nurses did not like him. One refused to speak to him and resented the time he spent with patients. There could be several reasons for their dislike. He was the author of a book that many people considered obscene, he advocated a "magnetic touch" that disturbed them and some considered him effeminate and perhaps even gay. Whitman remained in Washington after the war, working for the Bureau of Indian Affairs and the Attorney General's Office. One of the surgeons from the Armory Hospital tried to secure a pension for Whitman, saying that no one had done more for the soldiers and the government than Walt Whitman. The pension was denied, but he did receive a commendation. In 1883, a stroke forced Whitman to leave Washington and move to his brother's home. He never recovered but did continue to write until his death in 1892. Walt Whitman's writings give us an insight into the conditions at the hospitals during the Civil War. He wrote that he received more from the soldiers than they did from him. He considered his years of service a great privilege and the most profound lesson of his life. Two of his poems from that period are The Wound Dresser and Come up from the Fields Father from his collection of Drum Taps poems. He also wrote Memoranda During the War: Civil War Journals, 1863-1865 (Dover Books on Americana) , an insightful account of his wartime experiences. Washington keeps his memory alive through the Whitman-Walker Clinic, named in honor of his ministry of mercy as well as that of female physician, Mary Walker. Walt Whitman: The Measure of His Song.